Mitty Bedford is a young woman who has spent her life under the rule of a god-fearing sect, including the indomitable and vindictive Aunt Charity. Escaping to the city to become a typist, she meets the kind and loving Col. But she is conflicted; her sexuality has been repressed and she is laden with feelings of shame and fear. As she sets out on her journey to self-discovery and independence in 1950’s Australia, she comes up against the sexism and classism of the day. To truly be free, she must challenge others’ prejudices and fight her own inner demons. 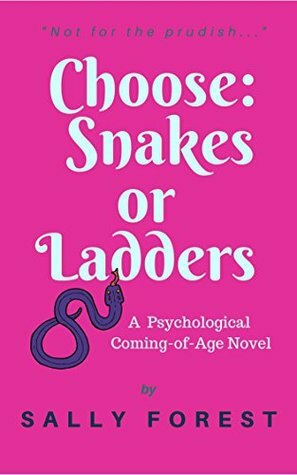 Choose Snakes or Ladders by Sally Forest is a book of many themes; love and loss, religion, shame, trauma, memory, gender, sexuality and the questionable nature of truth. Forest deals with these complex and universal topics with sensitivity and skill. Through her writing, she asks us to question our own biases and consider how relevant these issues are today. Forest excels at writing place and her prose conjures up the setting of New South Wales incredibly well. Her descriptions of the seasons are particularly beautiful; the dirt, pollution and heat of summer mirror Mitty’s feelings of oppression and add to an atmosphere of heaviness, whilst the freshness of autumn coincides with Mitty’s new found confidence. Forest also invokes the time period expertly, and I enjoyed the references to old films and magazines which gave some historical context and showed how influential the invention of advertising and the media was on thoughts and behaviour at the time. Mitty is an utterly believable and well-realised character. Much of the book consists of her internal dialogue, which gives us insight into her feelings of guilt and shame and makes her very relatable. She wants to be attractive to men and enjoys their gaze but she is also afraid of it and fears repercussions. Forest illustrates that female beauty and sexuality can be a poisoned chalice in a society where only women are castigated for the outcome of these things (this clearly has modern resonance too). The prejudice and ignorance of certain characters are well-drawn and had me seething with anger! The dialogue is predominately realistic and natural. Forest uses dialect for some of her characters- possibly to infuse more authenticity into the narrative- but I would have liked a little less of this as it came off as contrived at times and distracted me from the flow of the narrative. Although there is quite a steady pace to the book, I occasionally felt that Mitty’s day to day life was rather repetitive and that the plot could have done with a little more substance. There was definitely enough suspense to keep me intrigued though, and I think that any plot issues were reconciled by Forest’s use of prose and by her complex and likeable characters. Ultimately, this is a book about redemption. It is a moving and beautifully written story, which although full of challenging themes, eventually filled me with hope.